My deadline was coming up fast, and I was sitting there staring at a blank page. I cursed myself for having just spent the last hour surfing the internet instead of working on my article. The worst part is, this wasn’t the first time. As a writer, I’ve always had to manage my time, my energy and my attention. Of these three, I believe the only one you have control over is your attention. The passage of time is out of your control, and the chances are that you were born with a baseline energy level that can be hard to change. On the flip side, you have full control over where and how you ‘spend’ your attention. Managing your attention is the most powerful productivity technique you’ll ever try. Where you place your focus becomes your reality. Managing your time and energy is not enough. To be truly productive, you need to be managing your attention. Like time, people only have a finite amount of attention. I find that with every task I work on, and every notification that interrupts me, my attention gets depleted. This stands to reason. In 1973, Kahneman published Attention and Effort, where he explained that attention is limited in its capacity. And it’s getting worse. Recent research from Microsoft found that the average person’s attention span has dropped from 12 to 8 seconds since the year 2000. Sometimes it feels like I’m constantly bombarded with information that I can no longer see what’s right in front of me. The more noise there is in our surrounding environment, the more difficult it is to filter out the relevant information. Just think about all the advertising that surrounds your life—when was the last time you actually noticed any of it? In our overstimulated world, It’s OK to be covetous of your attention. This means minimizing distractions, blocking notifications and disabling alerts while working on the things that are important to you. What most people don’t realize is that failing to manage your attention will certainly decrease your efficiency, but it may actually affect your company’s bottom line. 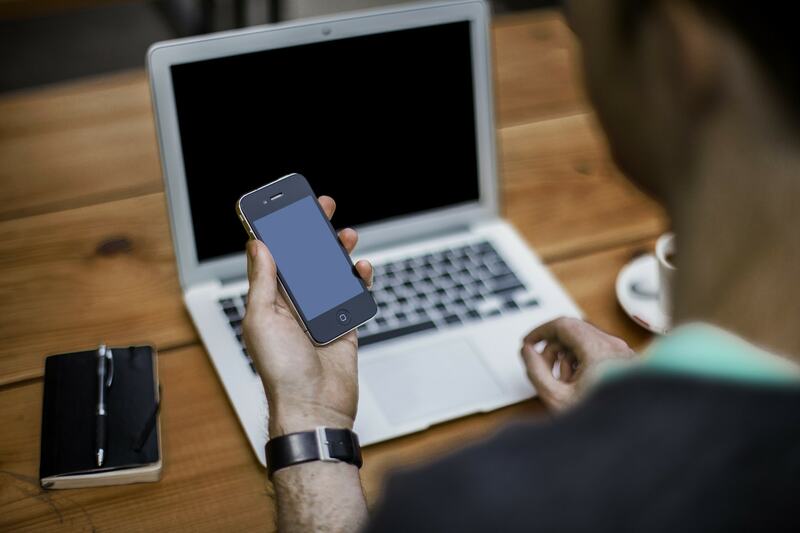 How many times does your phone buzz, ring, or vibrate in a day? If you’re like most, you are constantly bombarded with notifications—popups, buzzes, and beeps that interrupt workflow multiple times per hour. If this is you, you’re not alone. 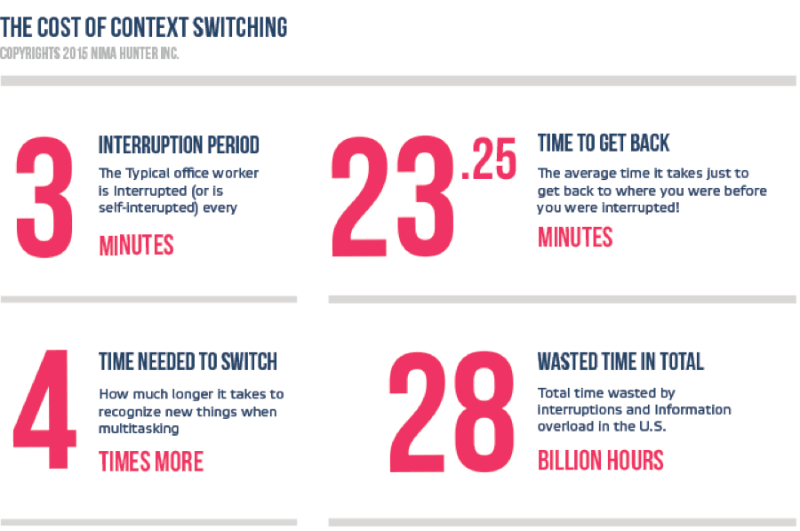 Researchers from the University of Cornell have found that on average, workers are interrupted or switch tasks, every three minutes and five seconds. The time it takes to get back on track? Upwards of 23 minutes to get back where you left off. 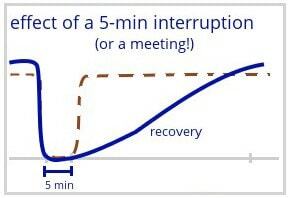 The red line: expected interruption recovery time, blue line: actual interruption recovery time. When I diligently practice attention management by blocking out the distractions, I can make sure that these interruptions don’t derail my day. Sometimes, simply closing my email program is be all it takes to be able to focus on the task at hand. Regardless of the method, being aware of distractions and proactively dealing with them enable you to take back control of your productivity, and produce better work as a result. Interruptions have become a fact of life, in both the personal and professional realms. Some say the “interruption culture” is something we all should just get used to. What these people fail to realize is how costly interruptions are. In fact, management science company Basex determined that unnecessary interruptions cost the US economy the staggering amount of $588B per year. Where does this number come from? It includes the cost of additional time needed to complete tasks, together with the fact that interruptions produce higher numbers of errors, meaning extra money spent to redo or re-check previous work. Finally, there is the psychological cost when employees are not able to complete tasks, which destroys morale and makes them more likely to leave (then the company is saddled with turnovers and talent recruitment costs). I’ve learned that not every task is a must-do. Tasks can be either important, urgent, or neither. According to Inc.com, “Important activities are beneficial and should be accomplished, if not right away, then eventually. Urgent activities are time sensitive, but not necessarily crucial to your bigger goals.” Go through your to-do list and designate each task as urgent, important, both, or neither. Don’t waste your time on tasks that aren’t crucial. To manage your attention, you need to be able to discern which tasks on your to-do list are most important. I use a popular system called the 4Ds. Delete. Scan your to-do list for tasks that are not essential, or that don’t get you closer to achieving your goals, and get rid of them. Delegate. If you know of someone who could do the task at least two-thirds as well as you, delegate it. Defer. Some tasks are important but can be done later. Anything that isn’t urgent - defer it. Just make sure you don’t continually postpone a task you’re dreading! Do. Finally, do the tasks that remain. Especially if this task will take less than five minutes, do it now! There are many products out there that can help you to block distractions. I use a website blocker that disables notifications and keeps me from surfing time-wasting websites. I also find it helpful to schedule an hour each day for managing email, rather than jumping at every message. Choose the method that works best for you to stay focused on the task at hand. While many think working from home will eliminate distractions, the reality is that working from home means you just get a bunch of different distractions. True, you won’t be subject to workplace distractions like people stopping by your desk, but you might be tempted by other time-wasters like surfing YouTube when nobody's watching. Working from home only works an attention management technique if it’s done with intention. Use your prioritization and distraction-blocking tools to conquer the at-home productivity demons. Finally, I’ve found meditation to be a powerful tool to clear mental distractions that clutter the brain during the day. It can be as easy as committing to a 10-minute session of meditation each morning, to center yourself and prepare for the day. Meditation allows mindfulness at work, which can help you to focus on what matters most and forget about the rest. Managing your attention is a powerful way to take control of the distractions that destroy your productivity and erode your happiness. The first step is to recognize the cost of interruptions, both in productivity and financial terms. Next, take control of your attention by prioritizing, blocking distractions and clearing your mind. Every day, you owe it to yourself to be as productive and effective as you can. Your future self will thank you! 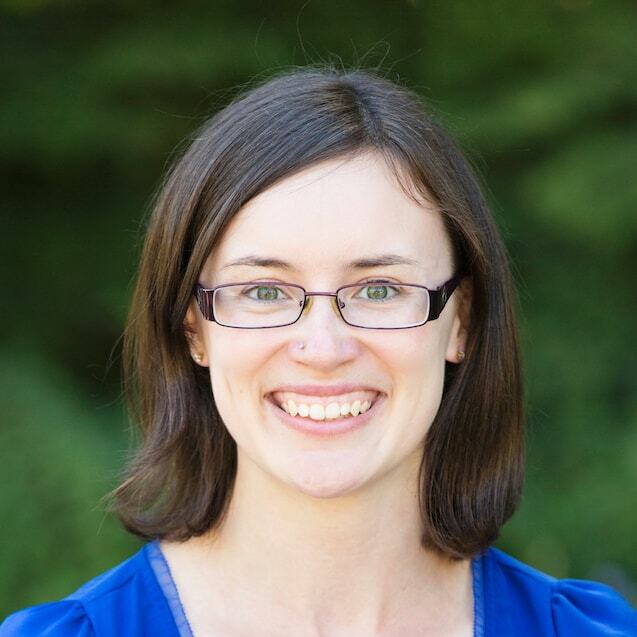 Courtney Apps is a freelance writer and business blogger based in Vancouver, Canada. She specializes in creating share-worthy content that helps small businesses succeed.